“It is a reprisal for having democratically defeated the coup, boycott against President Nicolás Maduro,” Bolivia’s president reiterated. 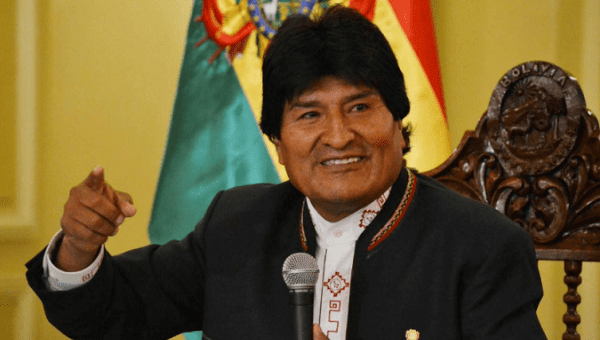 May 22 (teleSUR) Bolivian President Evo Morales has rejected a new round of sanctions imposed on Venezuela by the United States’ after Nicolas Maduro was re-elected as the country’s president Sunday. “We condemn the unilateral decision that imposes a new economic blockade to suffocate the Venezuelan people, in retaliation for having defeated the coup, boycott against President Nicolas Maduro democratically. Trump must understand that the world is not his estate,” Morales said in a tweet posted late Monday. The U.S. along with its right-wing European and Latin American allies have repeatedly called Venezuela’s elections a ‘sham’ before and after Maduro won at the polls. Morales’ remarks come after he congratulated Maduro on his re-election, and praised it as a victory against foreign interventionism. “It is a reprisal for having democratically defeated the coup and boycott against President Nicolás Maduro,” Morales reiterated. Over 20 million Venezuelans were called to the polls to elect their next president, where Maduro won with 6,190,612 votes, with a 46 percent voter turnout.